As we wind down the month of March, it's time for yet another glimpse at the glittering jewels worn by Princess Victoria Melita of Edinburgh and Saxe-Coburg and Gotha. 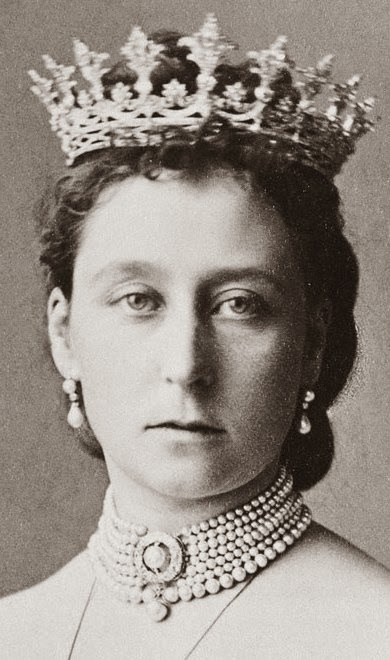 So far, we've looked at a suite of jewelry with links to her maternal Russian inheritance, the tiara she wore on her first wedding day, and the meander kokoshnik that she wore during her second marriage. Today's piece is a bit different -- it's a diamond tiara that she wore frequently but that never really belonged to her personally at all. The Strawberry Leaf Tiara of the grand ducal family of Hesse and by Rhine started its journey across the channel in Britain. 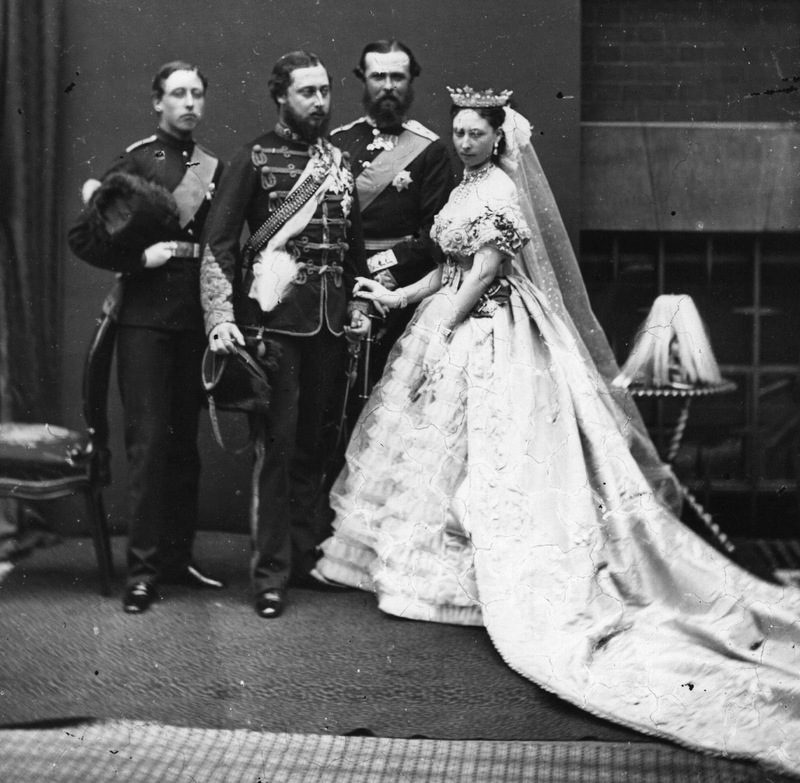 In early 1861, Princess Alice, the third child of Queen Victoria and Prince Albert, became engaged to Princess Louis of Hesse. Prince Albert, who was interested in jewelry, set about designing bejeweled wedding presents for his daughter; sadly, however, he died before the marriage could take place. The jewels were given to Alice by her mother, who was careful to note the late prince consort's role in their creation. Godey's Magazine catalogues the piece among Alice's wedding gifts: "a very beautiful tiara of diamonds, composed of a rich bandeau, with foliage, spires, etc., from Messrs. Garrard ... designed ... by his Royal Highness the Prince Consort" . Queen Victoria noted in her diary that the tiara had indeed been designed by Albert. Alice wore the diamond tiara on her wedding day, and she took it with her to her new home in the German grand duchy of Hesse-Darmstadt, where she was frequently depicted wearing the piece (including in the photograph on the left). Unfortunately, however, she met the same sort of untimely end as her father, dying of diphtheria in 1878, exactly seventeen years to the day after Prince Albert's death. One of her daughters, Marie, also died. The remaining five children survived: Victoria (grandmother of the Duke of Edinburgh), Alix (the last Empress of Russia), Ella (also later a Russian grand duchess -- she was the only family member who did not suffer from the illness), Irene, and her only surviving son, Ernst. Ernst, always called "Ernie," would eventually succeed his father as the Hessian grand duke. In 1894, he married his seventeen-year-old first cousin, Princess Victoria Melita. As she was now Grand Duchess Victoria of Hesse, she would be the next woman to wear the strawberry leaf tiara designed by her grandfather. The tiara was now essentially a part of the royal jewel collection of the grand duchy, and Victoria Melita wore it in portraits and on important occasions. One of the most significant of these outings was in 1896, when she wore the tiara during the coronation festivities for her brother- and sister-in-law, Tsar Nicholas II and Tsarina Alexandra Feodorovna. The illustration on the right depicts Victoria Melita wearing the strawberry leaf tiara (and, I believe, the emerald and pearl necklace we discussed last week) during the Russian imperial coronation . 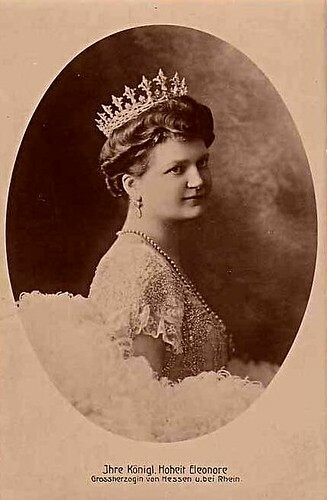 Victoria Melita would only have use of the tiara for five more years. In 1901, after the death of their maternal grandmother, Ernie and Ducky divorced. She continued to wear many of the jewels she acquired during her first marriage (including the emerald and sapphire sets) after the end of her first marriage, but this tiara stayed with the Hesse family. The next wearer, appropriately, was Ernie's second wife, Princess Eleonore of Solms-Hohensolms-Lich. 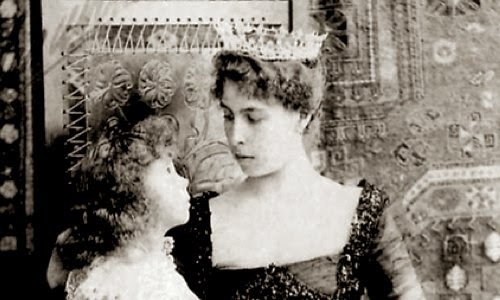 Both Grand Duchess Eleonore (see here) and her daughter-in-law, Princess Cecilie (the sister of the Duke of Edinburgh) were photographed in the tiara. But the tiara was nearly lost to history altogether: it was on board the ill-fated 1937 flight that killed several members of the Hesse family, including Eleonore and Cecilie . The strawberry leaf tiara is still around, even though it is not generally worn; it is exhibited to the public occasionally. It's also featured in Geoffrey Munn's 2002 tiara bible, Tiaras: A History of Splendor . The caption of the color photograph of the tiara in Munn's book gives us our best information on its current ownership. The image is credited to "Hessische Hausstiftung," which roughly translates to the "Hessian House Foundation" . The foundation was established in the twentieth century to preserve the family's cultural artifacts, including their massive art collection. It would make a great deal of sense if this historic heirloom tiara is a part of that cultural foundation today. 1. Cropped version of an image in the public domain due to age; source here. 2. See page 407 in this digitized edition of the magazine for a more complete list of Alice's gifts. 3. Cropped version of an image in the public domain due to age; source here. 4. Cropped version of an illustration in the public domain due to age; source here. 5. The family's turquoise and moonstone tiara was also on the plane, and was one of the only items to survive the crash; today it is owned by the Geddes family. 6. See pp. 102-03 for large photographs of the tiara. 7. Here's a link to the foundation's website.